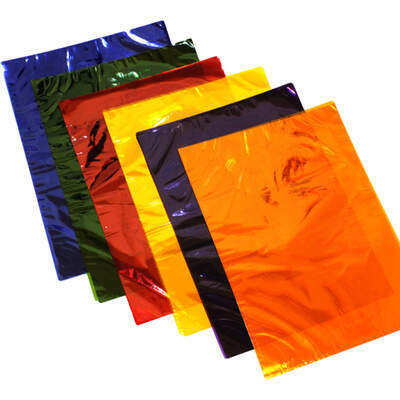 Enhance your handmade crafts or inspire their creativity with our A4 Cellophane Sheets. Lightweight and mouldable, they are presents in a selection of bright colours to suit your project. The pliable nature of this plastic material allows each sheet to be moulded to shape - whether you're creating exquisite floral decorations or wrapping up an unusually shaped present. They are cut to a practical A4 size - fitting in with the other paper products in your resources and allowing them to be stored easily. From schools through to offices and crafting classes, these cellophane sheets will inspire the creativity out of every single pupil. We have a wide selection of crafting items available online to suit your budget. With everything from PVA through to Creative Scissors or Glitter Shakers, we'll help you make the most of our crafting sessions, without breaking the bank.